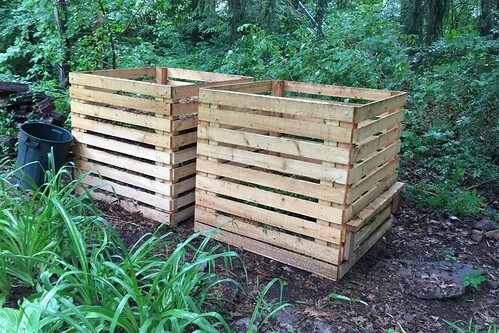 About a month ago, my husband made me a pair of new compost bins. They are beautiful!! A big improvement over the 5 little round plastic ones I had before. 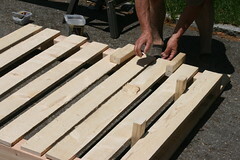 The photos show how he made them. 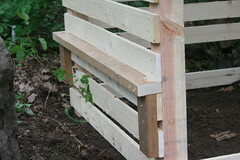 Slats are spaced 1 inch. 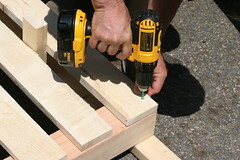 The front panel sits in a slot at the bottom and it then held in place with a removable screw and bolt. 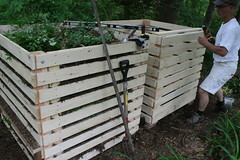 In the spring, I will remove the front panels to turn and use the compost. 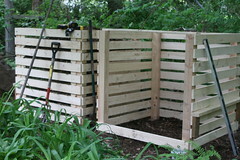 A really nice feature is that he made a step on the side of each so I can get up inside easier if I need to retrieve something or compress the compost. 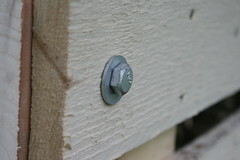 Since I had old wooden stakes and wire mesh fencing sections lying around, I drilled ground holes using a power augur to seat the stakes firmly and stapled the fencing sections in place around them. The result was long rectangles having dimensions of an Indore Pile, see https://books.google.com/books?isbn=0878579915.